Well, WordPress ate my first attempt at this post, so here I go again. Last week, a few of my TRPA cronies and I attended the Board Game Design Jam at George Brown College. (NOT to be confused with the Global Game Jam, which was the same weekend :P). We spent 48 hours eating, sleeping and breathing board game mechanics and design. Sunday evening we had the chance to have our games tested by the panelists/judges (which also included Tim Maly, founder of Capybara Games) and a bunch of random participants. At the end of the night, the votes were tallied and we won not just runner-up, but also first prize! We won copies of Game of Things, and another game I can’t quite remember the title of. Worst. Day. Ever. – A tile/card game where you play panicky artisans trying to flee the island of Atlantis as it implodes in various ways and sinks into the ocean. Collect parts to a “vehicle” (I use the term loosely) before too many tiles have disappeared.Hilarious and competitive. The Curator – You play a museum curator filling his museum space with artifacts, which randomly come up for auction from the deck. Many thanks to Adam Clare, David Fono, and their team, for making the event a fun and inspiring experience. Hope to see it happen again next year! 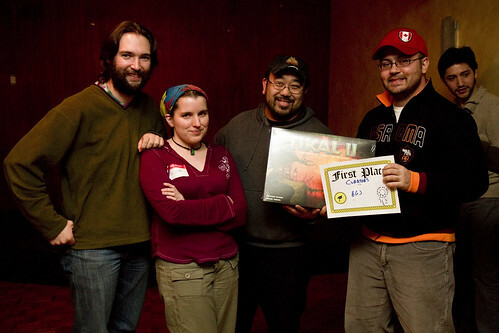 From Left to Right: Brian Valiquette, Megan Swaine, Eugene Fong Dere, and Daniel Quattrociocchi.